In the annals of forgotten albums, no album deserves to be forgotten more than the debut album from the Zambronis, Greet the Zambronis. Sounding like a cross between the semi-classical musings of Gentle Giant, the free jazz of Ornette Coleman, and Tuvan throat singing, the Zambronis were a staple of AM radio for one day: April 1, 1974. For some reason, Rhino Records decided the album warranted another look. So they just released Greet the Zambronis: Extra Gassy Edition, remastering the original album and adding a second CD of bonus tracks. I’ll get to the extras in a moment. But first, let’s examine this epic recording. If the Zambronis ring a faint bell, it’s probably because of the band’s only single “Wash Your Damn Hands” written by the band’s two main songwriters, Franklin Prosciutto and Johnny Dodger. The song is the opening track on Greet the Zambronis, and it captures all the elements that made the band so unremarkable. The song begins with the faint sounds of an out of tune honky tonk piano playing “Chopsticks.” Suddenly, Dodger’s guitar bursts from the speakers with a repeated 12-tone pattern played through four separate distortion pedals (0:07). Dodger had studied 12-tone compositional strategies with a great nephew of Arnold Schoenberg until a particularly harsh retrograde inversion destroyed his teacher’s eardrums. Sipping seven sultry egg creams. The sound of water running accompanies a few chords on a beat-up Casio keyboard played by the Zambronis’ nine-fingered keyboardist, Alex Alexander. At this point, first time listeners could be forgiven for thinking a pipe had burst in their basement. But Dodger jerks the listener right back in with a completely unnecessary vibraslap solo. The song’s bridge (1:32) is noteworthy for being one of the first examples of rap on a hit single. Upon closer inspection, however, it is apparent that the “rap” is actually Prosciutto’s neighbor demanding that the band stop playing or “I am calling the damned police.” This could be the reason that the song ends abruptly at 1:45. The rest of Greet the Zambronis does not live up to the sheer cacophony of the opening track. Nevertheless, there are some interesting moments on the album. “Danielle Sees Her Shadow” was chanted by Prosciutto after Bazooka accidentally tripped over a rainstick. “Clotted Cream (and Other Delights)” features a brass section of fifth graders. “Ice Ice Skating Baby,” the song that was supposed to be the theme song of the Zambronis cartoon series, is notable for being written using only half a chord. It’s the 31-minute closing number, “Trapped In The Sauna With the Boise Blues Again,” that supposedly resulted in the suicide of the band’s manager, the firing of the A&R rep that originally signed the band, and the class action lawsuit filed by people who had unwillingly purchased Greet the Zambronis. “Trapped” includes backwards vocals and backwards drums played forwards through a rotating Leslie speaker while a 20-piece bagpipe ensemble wails nearby. The song resurfaced 25 years later in a Xifaxan commercial, and it was part of the Guantanamo Bay “Music to Torture By” playlist. Rhino’s new release of Greet the Zambronis includes a bonus disk of unreleased tracks consisting mostly of the band belching in various keys. Completists will be pleased to find all nine versions of “Wash Your Damn Hands” that the band recorded in different languages, including Tagalog and Swahili. Purell’s 1982 remix of the song is also included. Of greatest interest is the one song that the Zambronis performed on the UK’s “Ready. Steady. No!” a cover of John Cage’s “4’33”,” that needed to be excavated from a vault buried 500 feet below the equator in Ecuador. The tapes were found to be unplayable, so they had to be baked in an oven for 90 minutes at a temperature of 450 degrees at which point they turned into a viscous substance that was then cooled to form a 78-RPM record. A specially designed stylus was created so that the recording’s finest subtleties could be revealed. Unfortunately, the record disintegrated as soon as the needle touched the vinyl, so the bonus track contains 4 minutes and 33 seconds of the lab technician sobbing uncontrollably. Greet the Zambronis was largely ignored by the press and listeners alike. Since the Zambronis were institutionalized soon after Greet the Zambronis was released, the world never got a chance to ignore their follow up recording. Still, if you really must hear the Zambronis in action or are looking for new ways of inducing migraines, be sure to check out Greet the Zambronis: Extra Gassy Edition. 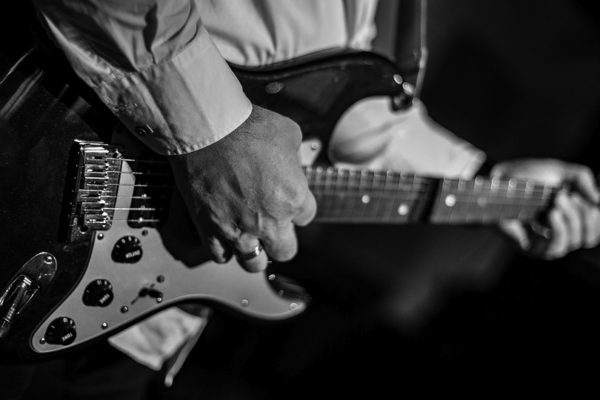 Photo Credit: Anonymous guitarist pic courtesy of Pixabay. P.S. If you didn’t figure it out yet, this post was written for April Fools Day.